Dr. Denny’s lifelong commitment to protect animals and to help those who love them began from the sadness of an eight year old when he lost a dear animal friend. From that grief sprang forth an intense desire to learn all he could to heal animals and safeguard children from the loss he had experienced. Since that moment as an eight year old he has never wavered on his decision to help people fully enjoy their pets. To accomplish his childhood dream he graduated from the University of Missouri with a DVM in 1987. In 1991 he returned home to work in Liberty with Dr. Bales, his family veterinarian when he was that little boy. They worked together until Dr. Bales retired in 1995. 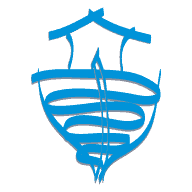 Dr. Denny then became the owner of Bales Animal Hospital, which was the continuation of the first veterinarian in Liberty. The first hospital’s address was in the basement under the drugstore on the square of Liberty. In 2002, the hospital was moved to a new location and renamed Ark Animal Hospital. The phone number is still the original phone number that is over 85 years old. 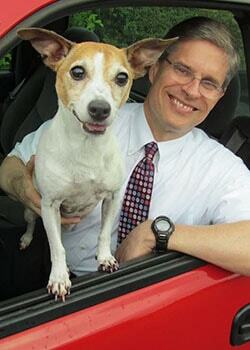 Dr. Denny wants your pet to stay healthy, which is why he has a special interest in preventative medicine. To keep your dog or cat happy, he has extra training in internal medicine, skin and ear diseases, diagnostic ultrasound, dentistry and advanced surgery. If there is a new way to help you and your pet he is committed to finding it. That’s why one of his professional goals is lifelong learning and improvement. Outside of the office he is celebrating the twenty-eighth year of marriage to his wife Linda. She is a first grade teacher at Faith Christian Academy. They have two girls, Danielle and Jacqueline. Danielle graduated from Wheaton College and is teaching English as a second language in Mississippi. Jacqueline is at Lindenwood University in St. Charles, Mo. His family worships at Faith Community Church. He enjoys personal fitness, hiking, triathlons and cycling. Precious, a Jack Russell Terrier, rounds out Dr. Denny’s family. Precious is always waiting in the window for Dr. Denny’s return. She is not there the whole day (the couch is much more comfortable) but somehow she senses his arrival minutes before his truck pulls in. She watches from the window then runs to the back door to greet him and makes him feel like the most important person in the world. Dr. Denny’s life would not be the same without the thousands of laughs and heartwarming “Precious” moments. Dr. Tucker knew he wanted to work with animals early in life. As a young teenager, he brought home his first dog, only to be devastated when his new best friend was diagnosed with Parvovirus. With the guidance of the family veterinarian and a “not-give-up-attitude” he provided around-the-clock nursing and loving care. Over the next three days they fought this life-threatening condition together. She survived, their bond was cemented, and she became the most loyal companion one could ever hope to have in life. She took part in every milestone in the Tucker household for the next 10 years. She endured the long road through college and veterinary school, moved to three states, and always kept tabs on the growing family. Dr. Tucker worked in many vet clinics in several different positions on his path to becoming a veterinarian. He started part-time as kennel staff for his family’s veterinarian in South Dakota before high school. In college, he worked nights as an emergency veterinary assistant. Dr. Tucker completed his undergraduate work at Colorado State University and South Dakota State University. After moving to Iowa for veterinary school, he continued to work at a clinic as a veterinary assistant. He received his DVM from Iowa State University. Although Dr. Tucker enjoyed his veterinary training at Iowa State University, his favorite part of becoming a veterinarian is interacting with clients, guiding them through any difficulties, and providing gold-standard medicine. Dr. Tucker’s special interests are surgery and internal medicine. He can guide you and your best friend through a knee surgery or a challenging case of diabetes. His constant goal is for your pet to be happy, pain-free, and as comfortable as possible. Dr. Tucker comes home to a very full house at the end of the day! He has 3 wonderful children; His oldest daughter, Katie, loves to play with the two family cats, Bandit and Duke. His middle son, Ty favors the household’s dog, Annie (a lab mix). His youngest, Wyatt, is inseparable from Scarlett, a lovable golden retriever. During Dr. Tucker’s free time he enjoys rock climbing and other outdoor activities. He hopes to become a volunteer track coach for students in the area. As a collegiate runner for a Division 1 school, fitness and competition have always been one of his passions. During his athletic career, he had the opportunity to compete at dozens of stadiums in 17 different states! He credits the dedication he learned from athletics for helping him keep focused on his education, work, and family life. 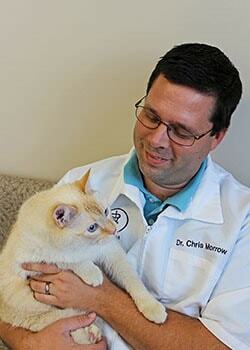 Dr. Morrow has had a lifetime of blessings from his pets. He grew up on a hobby farm at Lake of the Ozarks where he spent his childhood playing with St. Bernard puppies, caring for stray tabby cats, riding horses, bottle feeding calves, and raising orphaned piglets and ducklings. He found great joy interacting with and helping the animals who needed a caring hand. Today, he gets to start his day playing with his dogs in the backyard at sunrise, helping pets all day, and then finishing his day reading with his cat snuggled up beside him. A wise man once told Dr. Morrow that to have a long happy life he should find a career that was more of a hobby. Dr. Morrow took that advice to heart. He found his greatest joy when he was with the animals so, at the age of 15, he started working at his hometown veterinary hospital cleaning and taking care of the animals. He had the opportunity to work with dogs, cats, horses, cattle, pigs, raccoons, rabbits, ducks, turtles, snakes, and even a pelican. He found that he loved helping the pets and their families, and he has stayed in the veterinary field ever since. In 1996, he earned his veterinary degree from the University of Missouri. Go Tigers!!! 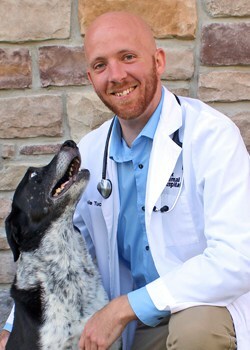 As a veterinarian, Dr. Morrow likes working with families that enjoy their pets and consider them to be family members. He uses a team approach to help your pets in need. He works with the pet, the pet’s family, his medical team, and almighty God to provide the best care for the animals. He likes to educate families on how they can keep their 4-legged family members happy and healthy. He feels your pet deserves to have the best care possible. Dr. Morrow’s wife, Debbie, also has a heart for helping others. Their family consists of 9 wonderful children; the youngest 6 are adopted from Guatemala, South Korea, Ethiopia, and China. They have 5 playful dogs (Gidget, Ace, Leo, Maya and Snickers). They enjoy family activities such as camping, hiking, and going to the movies. Dr. Morrow also teaches at the Maple Woods Community College Veterinary Technology Program. Dr. Morris’ interest in animal care and veterinary medicine arose as a natural transition from being raised on a farm helping with the livestock in northern Clay County, Missouri. There was never a shortage of opportunity to be involved with the care of his father’s herd of cattle. The care of the family pets and horse was his responsibility most of the time. Visits by the local veterinarian started to peak his interest in veterinary medicine as a career in his early teenage years, eventually leading to an after-school and weekend job during his senior year in high school and during vacations from college. Dr. Morris completed both his Bachelor’s degree and Doctor of Veterinary Medicine at the University of Missouri-Columbia. Following graduation in 1983 he worked in a mixed large animal/small animal practice in eastern Colorado for 18 months and 3 years in an equine practice in central Oklahoma. In February of 1988 he opened his own practice in Kearney, Missouri, initially as a mixed animal practice but transitioned to exclusively small animals in 2005. Dr. Morris and his wife chose to sell the practice in 2016 as they felt the need for some flexibility in their lives to do some traveling and to keep up with their two children who are now grown and live out of state. Since the sale of the practice Dr. Morris has continued to work part-time and has been at Ark Animal Hospital since May 2018. Dr. Morris enjoys all aspects of small animal medicine and has a special interest in internal medicine, dentistry and preventative health care. He places an emphasis on educating owners to their pet’s needs and feels this communication and their understanding of their pet’s health needs is vital to their recovery when problems arise. Dr. Morris keeps busy in his free time as the third generation overseeing and caring for the family farm where he and his wife, Cheryl reside. Bicycling, outdoor activities and regular visits to the gym round out most days away from the clinic. Dr. Morris and Cheryl have two sons. Nathan, the oldest, is a graduate of the University of Missouri and lives in the Denver, Colorado area and works in advertising and media content management. Brett is the youngest and is a graduate of Truman State University. He teaches instrumental music. He and his wife, Elizabeth, reside in Lexington, Kentucky. Dr. Morris and Cheryl have one dog, “Maggie”, an Australian Shepherd and two cats, “Truman” and “J.D.”. Dr. Horton knew from an early age that she wanted to work with animals. Her family was especially fond of Boxer dogs, and with their sweet personalities, she knew she would spend her life’s work helping other people’s family pets. She started out in the veterinary field as a kennel attendant for a clinic in the greater Kansas City area. During her undergraduate years, she worked as an assistant at the Kansas State University College of Veterinary Medicine pathology department. 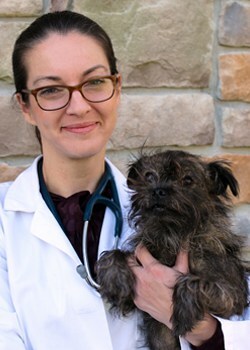 In 2005, she graduated from Kansas State University with her DVM, and the following year, she worked in a surgical and medical small animal rotating internship in a suburb of Chicago. Since then, she has had the pleasure of working with beloved pets and families. In 2015, she became certified in veterinary acupuncture. She enjoys integrating acupuncture for animals with painful conditions and neurological disease.